Previously, Kotaku showed how anime art changed from the 1990s to the 2010s. 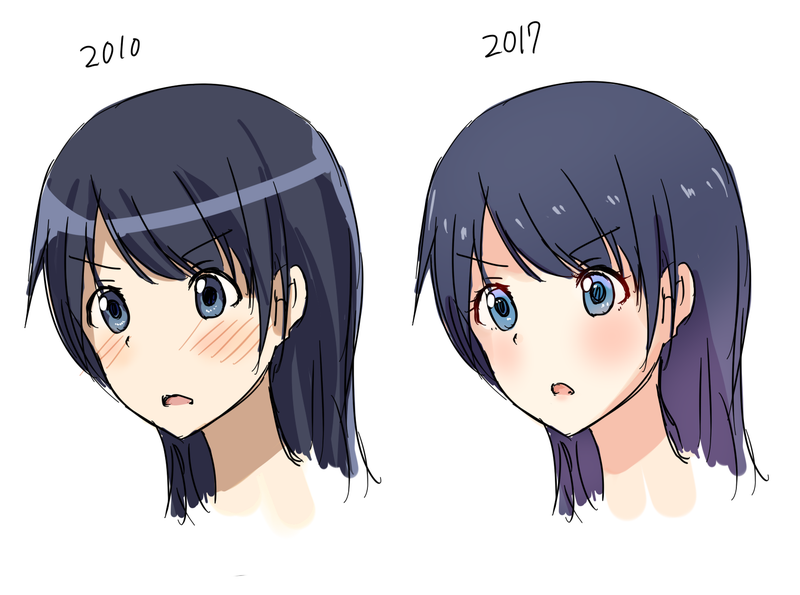 Now, let’s see see how anime art has evolved since the year 2010 in comparison to today. That’s only seven years! The changes are there, but subtle. You might have noticed them, but maybe not. The comparisons originally appeared on 2ch, Japan’s most popular internet forum. The below image is a revised version the net user uploaded after posting the top image. Generally, the difference is that anime art has become brighter. According to this comparison, anime art today has a lighter hue. Other differences include how the eyes are drawn, especially the reflection in them. The refection in the air is also different. The cosmetics, namely on the lips (here, the lower lip for the 2017 version) as well as the eyelashes, are more pronounced as is the cheeks’ color. Because the artistic style is constantly changing, in twenty, thirty, or forty years, the differences will be even greater.